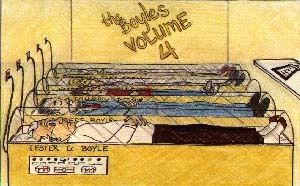 Buy this Audio Cassette with The Boyles - Volume 4 Cassette ~ Adam Kontras today! -Lester and Johnny attempt to play a prank on Dennis Rodman. -Johnny gets homesick for Suzy and runs away to West Virginia. -Lester calls a Psychic Hotline Number. What more can be said. -Lester falls asleep while Johnny is blaring Nirvana and Lester becomes Kurt. -We hear the Boyle men in ways we wish we hadnt. -We lose another member of the family. And its damn funny. -Yet another character gone, is this the end of The Boyles? -The Boyles make a discovery, and Adam confirms it, The Boyles are finished. -The Boyles go to Disneyworld to reak havoc for the last time. -Relive the memories of all 50 episodes. The final Boyles cassette (although not the final episode) is completely off-the-wall. While fighting with station management, Adam is forced to move the family all over the country, kill off main characters and finally go off on one last adventure before ending it all in the epic Episode 50. 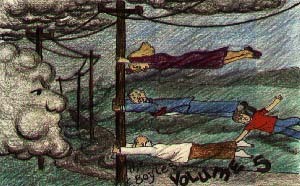 Later to be reborn on a different station, these 5 cassettes show the rise and fall (and rise and fall again) of the only ever cartoon family on the radio. To get the final 10 episodes, check out the Complete Boyles Collection including all 60 episodes, songs and commercials.